At RHODES SOLUTIONS, perfection is the absolute lowest standard we accept when it comes to your safety and security. That standard is maintained at all times by our established team of highly-trained dedicated individuals. Educated at the most prestigious military institutions, with skills honed in the world's most demanding operation theaters, our team's technical expertise is second to none. Every team member receives mandatory additional training in the application of their technical expertise designed for the commercial environment to ensure consistent, constant perfection. RHODES SOLUTIONS can provide the clarity you need to ensure a safe and efficient project execution every time. Whether you have specific training and service needs, or you only want to engage us to help assess what your project needs are, RHODES SOLUTIONS will work with you to tailor a solution to meet your needs. 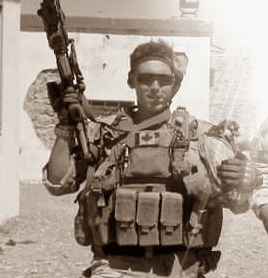 Nick, a veteran from the Airborne regiment of the French Marines (3-6 RPIMa ), first served as a Combat Medic for several years before being transferred as NCO in the Recon platoon. There, he qualified as a Commando Instructor; Jumpmaster; Firearms and Tactics Instructor; and Section Commander while being deployed in all major operations of the French army around the world. 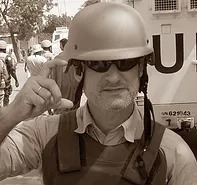 Since 2011 Nick has been working as a security contractor in numerous African countries, as Team Medic, Close Protection Officer, Security Manager, and instructor. One of his most recent mission had him in Mali where he trained hundreds of students from various backgrounds. Currently deployed in Burkina Faso, Nick still enjoy teaching and training during his time off. In 2018 alone, Nick successfully trained hundreds of police officers and first responders. To keep his skills current as a full-time student of violence, Nick holds countless valid and recent qualifications from world-famous medical and shooting institutions as well as the United Nations, the NRA, FEMA, the Emergency Management Institute, and the Department of Homeland Security. Jim comes to Rhodes Solutions with a wealth of knowledge and experience, serving both the private and public sectors. Jim brings with him 17 years of military training as well as 8 years of experience as a private contractor. While serving as an infanteer in the military, Jim deployed twice to Kandahar, Afghanistan. His last tour to Kandahar was as a Sergeant providing security for western Civil and Policing units. Taking his training one step further, Jim also became an Urban Operations Instructor and an Advanced Small Arms Instructor for the Canadian Armed Forces. Following his military service, Jim branched out to the private contracting world, working for many Tier 1 clients worldwide. During this time, he has attained multiple advanced courses in Close Protection, Vehicle Combatives, Surveillance and others. As an instructor, his intense drive to share his knowledge and passion for his work are evident. Jim’s real-world experience brings the tactical realism to Rhodes Solutions courses. Q: Tactical training for civilians? A: Absolutely. From introduction courses to more advanced training, civilians train with us. Most courses are composed by a healthy mix of civilians, security professionals, military and law enforcement officers. Q: Do you train military and law enforcement ? A: For the longest time, it was our main mission. From Tier 1 (SMU) units to TCN military across the world, we trained a lot of professionals from the Green Machine. Domestically, we focus on Law Enforcement agencies recognizing that departments with the lowest budgets are the one desperately in need of training. While we train specialized policing units, we are actively involved with General Duty officers. Q: I have been shooting for years, why do I need training? A: Shooting is easy. Being good at it is hard. And depending of your definition of good, it might take more than a course. Most of Rhodes Solutions courses are built around real life applications, from security professionals to competitive shooters, and those applications have standards. Our instructors will guide you towards those standards and make sure you know how to reach them. If you are already good, we will find you a new personalized definition of that word, promise. Contact us and we will make sure you get the training suitable to your skill set and needs. Q: Do I have to own my own gun to participate in your courses? A: Introduction courses can be done with RS owned firearms but for any advance courses you will need your own equipment and firearms. Please consult with us if you near gear and before bringing any guns to our courses. Q: Do I need a gun license to participate in your courses? A: No license is needed for our introduction courses. Q: Do you offer PAL/RPAL training or examination? A: We do not but we have a firearms introduction course if you are not sure about PAL/RPAL course. Q: I have some experience with firearms, but my wife has never shot a gun before and she wants to learn about guns. Do you have a course she can take? A: Absolutely! We have courses available for every skill level, from beginners to highly skilled shooters. We can find a course that’s right for her. A: Yes, we are happy to schedule Private Instruction at a time convenient for you. Private Instruction is conducted by the hour. Q: When is the next course? A: Courses are posted on our Facebook page. If you don’t use Facebook, contact us for our calendar and locations. A: You get what you paid for and quality is expensive. Shooting ranges are full of self-made instructors and YouTube is the biggest database you could imagine. You could learn from both, but when it’s go time, nothing replaces a quality instruction based on your needs, working on your skill set, delivered in complete safety by a trained professional. Qualified instructors with operational experience are far and between and a rare breed in Canada, and thanks to ITAR, training in the USA is becoming harder. You own hundreds of dollars’ worth of firearms and gear but don’t want to pay for training? Welcome to the fascinating world of collectors. Q: Why prices are To Be Confirmed ? A: Lots of factors influence our prices: location, range rental, number of students, etc. Published prices are for information only and there are ways for you to get a better deal: host a course, bring more students, LEOs and, of course, veterans get special pricing: at Rhodes Solutions we don't think they ask too much. Q: Why so many rounds? Why only factory ammunition and no reloaded? A: When you sign up for a shooting course with RS, you will do a lot of shooting. Shooting is like driving or golfing: to be good at it, you need to do it a lot; but to master it you need to do it a lot under the critical eye of a qualified instructor. During the course, you are going to understand how to make a successful hit and why you are not making it. Then, you’ll make it. You might not shoot all your ammunition but you certainly don’t want to run dry before the end of the course. On top of reliability issues, reloaded ammunition is a massive liability: you will be held responsible if your firearms malfunctioned and injured another shooter. Rhodes Solutions does not sell ammunition but can help you in finding bulk factory ammunition at the best price. Q: Why some courses required vetting? A: Some courses are very specifics and for security and liability reasons, we need to make sure you have a legitimate reason to train with us. Vetting process varies from proof of employment, security clearance and/or background check. Q: I'm a security professional (LEO, private contractor) can I attend a course in my issued gear? Can I switch gear mid-course and try new equipment? A: And you should! Remember: train as you fight because you will fight as you trained. Most of our courses are the best place to test your gear and make sure it works for you and the mission. Competitive shooters: some of the competition equipment, including some firearms is not suitable for the kind of shooting you will be doing; please contact us if you have any question about the gear list. Q: I am interested in hosting a course at my local range. What is required? A: Check the specifics with your range but usually, all you need to do is book your range with the appropriate time needed to conduct a course. As the host, you will be the contact personnel and organizer for the event and will be the link between the instructor and the range. Contact us and we will help you with the details for a successful event. Want free training? Host us! Q: What is Rhodes Solutions and its instructors? A: Rhodes Solutions started in 2011 as a security consulting company, working in hostile locations around Africa. We now provide close protection services, private security details, direct medical support, risk assessment, medical assessment, corporate security management, training and mentoring in remote and high threat environments. Rhodes Solutions instructors and consultants are coming from the most prestigious military units and possess a vast experience in military operations as well as in the private security industry. We maintain a very high level of competency by attending recurrent and up to date training courses around the world. Rhodes Solutions is a registered company in British Columbia, Canada where we provide high quality training to law enforcement agencies, security professionals, healthcare providers and anybody with an interest in developing their skills and knowledge. Q: Do you hire instructors or security specialists? A: Follow us on Facebook where we post specific jobs opportunities.